Received a letter today outlining plans to demolish the existing Business Centre on Lynchborough Road, to make way for a housing estate on the 6 acre site. Public exhibition on 16th December at reception. Sweetener being a community hall (not needed imo). Look at the debacle with the children's play area back in 2007. They need to sort out our frequent power outages & the safety of Hollywater Road first. Not to mention no bus service. We do not have the infrastructure to cope with any more housing out here. I think this has the possibility of being a nice place to put new homes. Passfield is lovely - all nestled into the woods like it is and I�m sure people will find that attractive. However, the fact that it is nestled into the woods does go hand in hand with having no amenities. You cannot walk/cycle anywhere in safety as there are no pavements leading to Bordon or to Liphook and no streetlights on those roads either. This � taken with the fact that there is [during term-time and excluding weekends] only the sporadic no:13 bus, which conveniently does NOT allow you to arrive in Liphook for the start of school hours [or normal work hours] � means that every household MUST have a car for every driver � and enough space to park all those numerous vehicles. So, the only real problem I can foresee is that the [completely necessary] cars will be parked all over the roads in the new estate and all over Lynchborough road (which is very narrow). . . . .UNLESS the developer is generous enough to space the dwellings out more reasonably than the national minimum requires, build garages bigger than the national minimum which are actually big enough to put a car into and open the doors, PLUS make-way for TWO driveway spaces per home. This would all mean less profit of course. I should add that the business centre houses many local small businesses. I am not sure where any other local employment sites are that would be able to take the influx of those searching for new premises (unless the business centre is remaining and just having houses places around the outside of it)? I understand that there is a simultaneous application being presented for a new business center within a few miles of the present location. This would offer relocation for all of the businesses before the current buildings are demolished. I must agree that the transport links to and from Passfield (and Bordon, Liphook, etc) should be prioritised. Probably a separate subject but it would be very easy to link up cycle routes for Bordon --> Passfield --> Liphook using existing paths / routes. Just look at an OS map and all will become apparent! Consideration needs to be given to amenities / facilities - please try to support it. How many house are they hoping to put up here? Is there a planning application reference? No planning ref yet. Exhibition on the 16th. I didn't get a flyer/letter. Can you give more details on the exhibition ie: where and what time. Dawn Meeting to be held at the Business Centre 16th December between 430pm - 7pm. I'm quite disgusted at how many residents did not receive a letter - albeit worded very 3rd middle management and not even in an envelope. I personally think the whole idea is absurd and totally unrealistic. We certainly do not want the value of our properties halved because of the sheer greed of yet another property developer. This is not Bordon - and it definitely does not need to become overspill. We don't want anymore Building or Traffic in Lynchborough Road - I feel there has been enough fatalities along the Hollywater Road already. Perhaps pnh Properties should Townsville on there own doorstep. Well, we finally got down to the real objection here..... Don't want more much needed housing cause it will devalue your own.....! How community spirited of you! The value of housing is never taken into account by the planning authorities, so rest assured there. If permission is refused the local authority have to spend thousands defending their decisions when the developers appeal, so all reasons for refusal these days have to be based on matters such as proximity to schools and services. I imagine that with all the new houses being built in Bordon, and the relief road being built there, it could be assumed that Bordon would be just as close as Liphook. If there is enough increase in population a new school will be built there, as would a railway station, but not until the houses are all built over there. Unfortunately as there is no Neighbourhood plan in place yet for Liphook, developers will feel empowered to try. The starting figure Liphook was given was 175 extra houses, but that does not have to be strictly adhered to. Each time any housing development is refused, it means another developer comes forward to try and "grab the quota" so to speak. What do those who live near by want to see replace the business centre, as clearly it isn't going to be there forever? As I see it the choice is housing or something commercial. Based on posts about the empty garage in Liphook a drive thru McDonalds seems high on locals wish list!!! If you go to the EHDC very good interactive map, you can see which areas are inside the settlement Boundary and which are specifically excluded from the settlement boundary. the bottom half of Lynchborough Road and the whole of the Enterprise Centre is specifically excluded from the settlement boundary policy map. It will therefore not be as straightforward as other applications as there is not a presumption in favour of development - which normally ties the hands of the planners as they have to say YES unless it contravenes a small list of objection rules. Land specifically excluded - as this is - is deemed greenbelt / countryside - which means much tighter restriction and a greater ability for planner to say NO. That said, we have a chronic housing shortage in the immediate area which is causing misery to those looking for a place to live for the first time - and they need to go somewhere. Not sure that is correct. It appears to show that the Business Centre itself is in the Settlement boundary, but some of the land behind it isn't. i think the editor is correct, after studying the map about half of this site is within the settlement boundary which means the other half isn't. Therefore two sets of planning rules and considerations apply. I'm not sure if it is financially worth developing half the site and the remaining land which is predominantly grassland and full of wildlife sits with the current owners or will that become common land for the use of the community? Serious consideration needs to be given to the hollywater rd junction as leaving Lynchborough rd is a bit of a lottery as the hedgerows are high,close to the road, on a bit of a blind bend and close to passfield straight. Bizarrely,Hampshire county council has dropped all the local speed limits to 30mph apart from this area of hollywater rd and passfield straight. There is also a warning sign missing when approaching from hollywater advising you that Lynchborough rd even exists which is fine if you're a local but dangerous if not. The land at this junction belongs to the national trust so I very much doubt they would be prepared to give it up to improve this junction to make it safer for the developers to overcome this issue especially with the major increase of traffic currently using this road for residential and business use. As already stated in an earlier post, there has been a tragic accident at this junction in recent weeks and I believe it's not the first on hollywater rd and it's common place for accidents and near misses at hollywater rd/ passfield straight junction. The site is also well within the 400m SPA (special protection area) buffer zone and the 500m SAC (special area of protection zone). How did the relatively new houses at Lynchborough Rd and the Lyndons get permission to be built then ? the same countryside restraints existed then, eg National Trust Land, Countryside etc? The Lyndons and Eleanor close are within the settlement boundary where the restrictions are far less I assume. I'm not sure if the same restrictions applied 20 years ago when they were built or if there was SSI designation to the area near by. These current regulations are to stop urban spread and to protect the countryside and wildlife. I'm sure all will be evident in the fullness of time. I am pretty certain though that this is purely a commercial proposition and not for the good of the local community. We don't even have a footpath to link us to Liphook let alone a decent public transport. I'm sure there will be arguments for and against this proposal. We campaigned for a footpath some years ago. We didn't get one because the land is part of a SSSI site. So I'd like to know how they can then consider building 50 houses. 50 houses = average of 2 cars per household , that's 100 extra cars. The plans had better include ample parking as we can't have Lynchborough road turned into a car park because of this new estate. The road is narrow & us existing residents struggle to navigate in & out of our drives due to inconsiderate parking as it is. We are yet to have our local exchange upgraded so we are on slow broadband . The exchangewon't cope with 50 extra households. Not to mention our power supply which suffers frequent outages . In the letter is states we are a village which we are not Passfield is a hamlet and we do not have the facilities to cope with a large estate. The lyndos originally was supposed to be much larger than it is & I believe Squire Bridge (?) had to alter their plans many timea for it to pass planning. The settlement boundary expands when new houses are built and then the settlement boundary changes so that the new houses form the boundary of the settlement again. Maybe the lyndons estate replaced one large country house there? There must be some records of how permission was given. After all, If one goes back 20 odd years the settlement boundary of Liphook was not where it is now! the settlement area doesn't expand into green belt land, national trust and, ssi land. This area may be considered to be a brownfield site by some but half of the site is out of the settlement area, fact! The road, junction and infrastructure of the local area can't cope already. The local exchange is old and I frequently get a download speed of about 0.5 meg download and upload is at best 0.3 meg continuously so more load on a fragile exchange is a concern. Any householder development applications out of the settlement area are subject to the strict restraints of planning so I would expect the same rules and integrity applied to this application when it's made. This quite rightly has been highlighted in a previous post, this isn't a village, it's a hamlet. Most houses in Passfield are probably on their own sewerage arrangements so could the addition of more housing be accommodated by the mains sewerage or will Lynchborough rd suffer the same issues as Portsmouth rd, longmoor rd and headley rd in Liphook..
Liphook was given a target figure of 175 additional houses by EHDC. We already have a housing allocation by EHDC of the 175 at Lowley. Another 40 have been approved at Bramshott Place. The appeal for 100 houses at the poultry farm will be in the new year. The field at the top of the Headley Road has had a proposal put forward for some 30 more houses. That is almost double Liphook's quota. Now another 50 in Passfield. What happened to all those complaints about our roads being unable to cope with traffic NOW? What about supporting a Neighbourhood Plan? Liphook has been given a MInimum figure in EHDCs local plan, not a maximum figure, no neighbourhood plan can reduce housing numbers, they are all to encourage more housebuilding, but housebuilding only where there are minimum of housing restraints, and in places the whole community would approve it, hence the need for a referendum. If you look at the maps of the expansion planned for Bordon, Passfield is closer to Bordon than liphook. Also in EHDcs local plan, is encouragement to redevelop brownfield sites for housing. Looking at old maps, Passfield was a small counrtyside location before the Lyndons and Arundel Close were built, so those living there must remember that unless they want huge numbers of houses to follow in their wake, services there are not going to be improved, as a previous poster said, it is a countryside location, surrounded by National Trust and National Park land. Just FYI, Passfield is closer to Liphook than Bordon. The road sign in Passfield alone shows this. Our address is Passfield, Liphook, GU30 etc, our phone code is Liphook area not Bordon and we are under Bramshott and Liphook Parish Council. Just a small point, but Passfield is not part of the large Bordon redevelopment. Hi Sarah, yes I understand that at the moment Passfield is closer to Liphook. I was making the point that after the expansion of 3000 plus houses in the Bordon area, that the new expanded outskirts of Bordon, which will bring Bordon closer to your area, may become closer to reach from Passfield than Liphook is now. 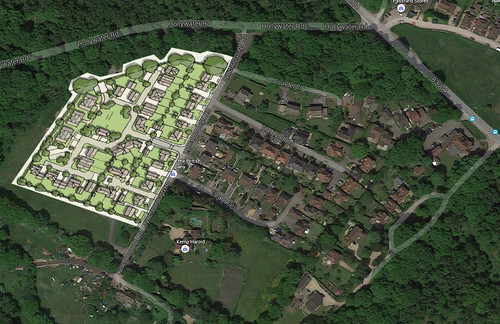 I've superimposed the design over an existing satellite shot of Passfield. The development is all within the current Settlement Boundary. Excellent. So the entrance/exit right opposite our houses/driveways then! Not to mention the prospect of being directly overlooked by 6 properties? This doesn't sit well at all with some residents of Lynchborough Road and we will be lodging our objections. I can see that the row of Harvey Cottages will have 2nd story windows looking directly at them, which isn't good at all. The design replicates the density of The Lydons - but the roads all look too narrow to accommodate a fire engine & parked cars combo - and the driveways are not big enough to provide for the parked cars either. In an area with no public transport, and no pavements to walk or cycle to Liphook safely that is a recipe for disaster. Every adult householder will need a car and they will all have to be parked somewhere. The problem is, as always, car parking is NOT a planning issue and the design can only be approved on limited planning issues - if it is inside the portion of the site designated as the interior of the Settlement boundary. If they are hoping to gain the approval of local people then they will have to do better than this. Just realised the meeting/exhibition is today. How are people at work supposed to attend when it closes before they get home? Great, so Passfield is slowly becoming another sprawl, small but nevertheless significant. The so called exhibit is timed to ensure fewest attendees and least opposition. As soon as a planning number is filed we need to object. I have an office in the Passfield Business Center and I also live in Passfield. I was at yesterdays meeting. I personally think the development looks good and the designers have taken a lot of positive factors in to account, this all to the benefit of the residents and community. Would a new two-story business center (up to five times bigger than the current operation/occupancy) be any better than housing? Probably much worse in my mind. I do disagree with the position of the current road entrance. This may cause unnecessary light pollution for the properties on Lynchborough Road. "Light pollution" may fall under UK Laws and certainly worth looking into. The developers may wish to review the position of the road entrance so that it [doesn't] affect any existing properties. Like any new estate they are always rather barren in the first years, however a tree planting scheme could be included as part of the planning considerations to provide privacy to existing (and new) homes. What is happening with the land to the east? Will this become a park? Will the developer put a link path or cycle route through to the common? After all the Shipwrights way passes very close. It would be good to have such connections to our wonderful countryside. Imagine being able to walk or cycle for miles around in safety. Certainly great for all individuals and families alike. We could also work with the developers to install faster broadband for the community. A fibre cabinet could be installed for approximately �30K and would adequately serve the entire community, including the proposed new development. There will always be the question of building on the site and an objectionable approach may not be the right way to look at this. My thoughts are to take a positive stance with the developers to achieve the most pleasing development, environment and quality of life for all. My preference is homes, not commercial. What are your thoughts (not that I should need to ask on TalkBack!) ? You have until the 23rd Feb to submit your comments. I attended the 'consultation ' meeting in December and requested a copy of the traffic survey and the environmental/water assessment reports which the planning consultants referred to in their 'sales pitch' but to date have not received anything. Of course, on the night the consultants engaged by PNH did not seem to think it would be a problem to provide these documents. Presumably these documents are now available on the planning portal using the link in the earlier post? The link takes you to the planning application. you can view the attached documents (32 of them), by clicking documents? There are very few residents comments so far - however this is not unexpected as EHDC in their wisdom have not informed anyone that the application has been submitted!!! As this is an outline application I have written my objections to the basic principles of applying urban parking quotas (where residents can rely on pavements, cycle lanes, buses, tubes, trains etc) with this rural satellite location. Particularly given the narrow and dangerous junctions in the immediate vicinity. My letter is long (what else would you expect LOL) and I have reproduced here for anyone who is interested. Response [objection] from Mrs Dawn Hoskins to: 21479/014 | Outline Application - 48 residential units at Passfield Business Centre, Lynchborough Road, Passfield. Although I have no doubt that this plan will forge ahead, I feel duty bound to pass comment on a number of points relating to the misleading manner in which this proposal has been submitted. In essence, I have no objection to houses being built at this site, but I do MOST STRONGLY object to urban minimum parking quotas being used in this rural 'satellite' hamlet. I also object to the way in which the developer speaks of car use and the possibility that there is an alternative option in this remote area. Firstly, it should be noted that the uniquely isolated, secluded and remote nature of this hamlet which is 'cut-off' from all other areas by a margin of 3 miles or so, sets it aside from Liphook and Bordon which are the nearest towns/villages. Apart from this immediate vicinity, the hamlet is exceedingly rural and mainly unlit and unpaved for both road and pedestrian traffic. Only the main or newer roads are tarmacked with the other roads around the woodlands being unmade and unadopted. There is no footpath into Bordon and no footpath into Liphook. Despite the designated speed restrictions on the B3004 into Liphook and the Hollywater Road into Bordon, the rural nature of the roads, the lack of speed controls and lack of enforcement results in speeds more normally approaching 60mph. What tarmac roads there are, are unlit; have no cats-eyes and no white lines in the majority of the hamlet. The main route to Bordon, The Hollywater Road, is only just wide enough in place for two small cars to pass. The only pub, The Royal Oak, is about half a mile away down this road where recently a pedestrian was knocked down and killed. It is entirely unsafe to cycle or walk along these roads to access the nearest villages with amenities. The closure of the Pub in past years was a blow for the hamlet but the shutting of the Post Office was quite devastating and consequently, all pension collections and postal trips must be driven into Bordon or Liphook. All trips must be done in a vehicle and even then, the speeds on the B3004 and the Hollywater Road, which is pitch black at night, have resulted in a large number of RTA fatalities and near death collisions. There are 'shrines' to the dead in numerous places in our hamlet. The developer mentions the bus towards school in Liphook saying that there is an alternate means of transport other than the car. This is, at best disingenuous - at worse a complete lie. They clearly HAVE NOT investigated the nature of the No:13 bus service. The most frequent [by car] departures from family houses are school runs. The catchment for this development will be Liphook infant & juniors and Bohunt School. It is entirely impossible to catch a bus to school from Passfield. Everyone knows that - and a cursory glance at the timetable confirms it. The bus departs at 7:12am. then a big gap so no-one can get to school for 8:30am. with service resuming 9am until 5:45pm when it stops. The bus does NOT run at weekends and EVEN WORSE, the service is restricted only to days upon which Alton College is open. So no bus at weekends, no bus in school holidays and even if you were minded to get the bus to school/work in Liphook - you can't - as it does not run at this most crucial time. To allude to a possibility of bus travel in this hamlet is dishonest and an entirely inaccurate portrayal of the reality of living in a secluded and remote hamlet which has no amenities of its own. These are family houses that are being built, and due to the specific and individual nature of this location - everyone will need ua car. It is not possible to consider living here without one. If there are 48 houses and 2 adults in each there is a minimum requirement for 96 car parking spaces just for them (this does not include any other family members who will be driving and all the friends and family that may be visiting). Youngsters in this location all take their tests as soon as they are 18. If they are to travel from hamlet to hamlet to see their friends they have no choice. In our family home we comprise of myself, my husband, our three sons and in the annexe - my father. In addition to having one car each, we also have a camper van. There are 7 vehicles on our drive at night. Apart from having a 'granny-annexe' we are not unusual - that is simply the reality of living here. According to the plans submitted, only the largenr properties have garages. The smaller properties have only allocated parking spaces. Given the secluded 'satellite' nature of this hamlet, for the number of vehicles that will necessarily be owned by the house owners - there is simply not enough parking provision provided. This will cause an intolerable situation in Lynchborough Road and risk cars being parked on the approach to the horrifically dangerous Hollywater/B3004 Junction. The average Fire Engine needs a minimum width of 4m for access. At the moment this is fine - as although all the roads in the vicinity are narrow, there is no 'on street parking'. Hollywater Road is too narrow to allow for both on-street parking and a fire engine to pass, as is Lynchborough Road which is too narrow, The Lyndons which is too narrow, Eleanor Close which is too narrow, and Arundel Close which is too narrow (Arundel close is not marked on the site plan). God forbid overflow cars being parked on Hollywater Road! That means that ZERO cars can be parked on any of the roads in the vicinity. None of these roads will be able to accommodate overspill car parking from the new estate without blocking access to emergency vehicles and rubbish collection vehicles. It will cause a complete and utter nuisance and upheaval to local residents. Even for regular car parking, there is not enough provision within this new estate, but what if, for example, the new homeowner also has a works lorry or works van? Too big for the designated parking area - where's it going to go - Lynchborough Road? As family houses in this particularly secluded satellite location, it can be assumed that a large percentage of the home owners will be going out in the mornings to take the children to school and out in the afternoons to collect them. (As previously mentioned there is no public transport option in this location to get to school - the car is the only way). Additionally, any commuters returning home will be arriving well after 6pm. It is therefore, unreasonable and statistically fatally flawed to conduct a traffic survey which excludes this time period. The survey undertaken by the developer counted traffic movements only between the hours of 4pm - 6pm. It is also fatally flawed statistically to accept the comparator in this instance. There can be no comparison between an employee who is duty-bound to remain within the premises to conduct his work - and the prerequisite movements of a family. To use such a flawed comparison as a base for any study is laughable. It completely beggars belief that this comparison has been used at all, let alone being used as factual statistical grounds to categorically state that the new estate will have a 'negligible impact' compared to what is there. It is embarrassing for any professional to look at this nonsense and take it seriously and I would demand that this be completely disregarded. It is pure fiction. The normal accepted vehicle movement ratio for a family home is 8 (per family home - per day). One person going on a school run every day, out and back twice, is 4 vehicle movements. If there is one other adult going out to work and coming back - that is a minimum of 6 vehicle movements per family home per day. That is a minimum of 6 movements as long as there is no shopping to be done, no meetings to attend, no after school clubs, no visitors or social activities - which is highly unlikely!!! AND this is based on only 2 drivers within the household. The reason the 'accepted norm' is 8 vehicle movements per family home per day is because that is what is NORMAL. It is utterly ridiculous to suggest that in this case, in this particular remote estate with no amenities and no public transport that this would be reduced. If anything - it will be more. 48 family houses x 8 movements per house per day. That is 384 movements - given the nature of this location, its remoteness, lack of any amenity and lack of any public transport to get to school - I would say that is an understatement. That IS NOT in any way a 'negligible impact' compared to what is there. A traffic survey should, at least, reflect reality. I've read some slanted and biased surveys in my time but this really does take the biscuit! Dangerous Junctions in the Immediate Vicinity. At the exhibition/consultation that the developer ran to interact with local people, the majority spoke with great concern about the very high number of deaths and near death injuries that have occurred along the Hollywater Road, the Lynchborough Junction and the Hollywater Junction. Although the majority are speed-related incidents the other contributing factor is the very rural nature of these roads. Driving up to this site from Whitehill (nearest supermarket) the road is bendy, narrow and unlit. The bend in the road results in the Lynchborough Road junction being entirely invisible to approaching cars - often driving at excessive speed. Exiting Lynchborough Road can be a very hair-raising business, as cars - which were previously invisible - screech and skid all over the road to avoid hitting the back end of your vehicle. I believe this has happened to every single resident here. Arundel Close has not even been drawn on the site-map, the entrance/exit of which further reduces any available on-street parking on Lynchborough Road. The Lynchborough Road junction is a very dangerous one indeed. The increased traffic movements from 48 houses cannot make this any better yet there seems no plan put forward by the developer for speed reduction mechanisms or to increase the sight line around the bend? More worryingly, the likelihood that cars will be forced to park along Hollywater Road is exceptionally high. With the Junctions already being of such a dangerous nature, the thought of cars being parked-up to reduce visibility even more is an appalling one which will undoubtedly have disastrous consequences. Although it is laudable to provide this token towards a cohesive community. It is a great concern to me that this will become a 'millstone around the neck' of the Parish Council - who I presume will be the owners of this hall? The developer has provided no detail as to the financial obligations of this hall - who is to own it? Who pays for electricity, gas, heating, lighting, water, toilet rolls? Who is to maintain the structure? What is the maximum capacity for the hall use and where will all the users park their numerous vehicles should they attend a function at this hall - given that there is not even enough parking provision for residents? There is no clarity on this issue and until the facts are written and we can be assured that there will be no financial implications to local people as to the running and maintenance of this facility, then I can only object to it. The developer has omitted to give any details as to where the local employment site is going to be moved to? This needs to be clarified. The use of 'Shared Space'. As a final point, I would like to object to the status of 'shared space' within this new estate. The developer states that the new estate will be laid out using 'shared space' so all features such as curbs, road markings etc will be non-existent. This is simply a means to create the illusion of space whilst offering no safety for vehicles, cyclists, pedestrians and children to mix safely within the estate. Roads with no pavements for children to walk on - is madness. Anyone operating under the illusion that cyclists or pedestrians will only use their designated 'separate' entrance to the south-west of the site is unrealistic in the extreme. I can understand 'shared space' being used effectively in very urban areas like city centres - but not in this exceedingly rural area where it is totally out of keeping with all the other roads and houses. Humans, cyclists and cars do no mix and we have had our fair share of RTA deaths in Passfield to prove this. I urge you to enforce a sensible rural average of car parking spaces per dwelling which would realistically mirror real life in this area. Do not simply acquiesce to these inadequate and inappropriate minimum 'city' levels where the bicycle lane, the tube, the bus, the train and the footpath are viable options. An absolute minimum of 2 off-street driveway spaces per dwelling is needed (and even this low level will cause problems). If a Community Centre is to be built then clear financial implications should be set out as to management and maintenance. Additionally, whatever the maximum capacity for this community hall is - then THAT is the number of parking spaces that should accompany any design for it. If x30 parents with prams are going to turn up for a toddler class - they will want to park close to the centre. This is a blindingly obvious fact that the developer seems to have overlooked. Where are all the users going to park when the surrounding roads are not suitable for on-street parking? At the developer's expense, highway safety measures to improve the safety at both Lynchborough Road and Hollywater Road junctions should be established. Excellent letter. Who could possibly not take notice of all those crystal clear points?! Excellent response Dawn. This spells out my concerns exactly. It is so important that everyone who has an opinion does log their comments on the Council web site BEFORE the fast approaching deadline as once approvals have been granted you can't moan and groan if you didn't voice your concerns when it was important to do so. Great letter but might it be better to work with the developers to achieve the desired result? I hear that if housing does not go ahead, there could well be another business center built, much bigger than the present. What will that do for traffic and the area? Something that you don't mention, but is there any argument regarding disability & access in all this road / parking objection? Totally welcome a new Business Center! When the new housing estate is built we could lose our shop. But never mind, we can always catch the non existent bus to Liphook or L.indford. Yes I think that my letter sets out how I want to work with the developers to achieve the desired result. I have already stated in the top lines that I am not in essence objecting to the housing - only that they are family houses which will need adequate parking provision. this is only an Outline planning permission - so the developer is testing the water to see if he can have houses and what considerations would have to be met for any permission to be given. So - I have laid out what I think the specific considerations are. Only when a Full application is submitted will you be looking at detailed drawings - at which point you would base your comments upon the tick list that you have included. So at that point you are not objecting to the principle but, perhaps, the height or the look of the structure. So - for the Outline - we need to make sure the planners understand that in this rural, car-dependent vicinity - the car is king and it needs to be parked! Vehicle-related issues are the biggest problem with this application as far as I can see and this needs to be made a 'condition' by the planners who are considering it. Please consider using your real name - it is not nice to be talking to people and not know who they are. I'm going to object via my Barrister. I'm completely confused as to why I did not get a corresponding letter from EDHC as I'm a co joining property. Maybe this will be dealt with the same way - PBC over night lay-by to entrance permission ???. Amazing it's not what you no - its whom you no - or perhaps how much money you have. Hi Michelle, I thought the PAssfield business centre was a detatched building not co joined to any other building? I didn't mention anything about Buildings. Hi Michelle, forgive me if there is confusion, if you are referring to land ownership, EHDC will only be able to write to those adjoining people who are paying council tax in the form of business rate or council tax for a domestic property where they have registered records of buildings with a postal address. Land in itself does not attract council tax without some form of building, so if you are not paying council. tax on your adjoining property they will not be able to send you a letter. You could always register your comments online anyway? Which is exactly my point - as all of the above applies to me. It is a registered address - there are buildings on it. I do pay Council Tax - a lot of Council Tax. My residential property is next door and part of the adjoining property. But I still didn't receive any correspondence. The biggest problem is the building it's self it's full of asbestos, when ever we worked in the loft area had to sign a asbestos register. It's a shame but asbestos was a great material when the building was built. You can't do much alterations to the building without disturbing the asbestos. So in the long run its most probably safer if it was demolished!!! I looked on-line and can't find any letters from neighbours (can't even find my own letter)! Re: Proposal: Outline Application - Redevelopment of the site to provide 48 residential units with associated community hall, open space, parking and landscaping. Thank you for your comments which have been taken into account by the Council in reaching a decision on the above proposal. I can now advise you that the application was refused permission. this time for even MORE houses and EVEN LESS parking. By changing the company building the site, the Business Centre has very cleverly tried to LINK this to the sites in Whitehill & Bordon (Louisburg Barracks North [LBN]� also being thrown up by Wimpy. The reason I say, clever, is that the previous application here was turned down on the grounds that it would be a loss of a valuable employment site. As Wimpy are setting aside land for �employment� in Bordon they can contend that although there will be a loss of a site in Passfield, it will be countered by the gain of a site nearby. Not only that, they seem to be linking the build of the industrial site in Bordon as a legal condition. Basically, we only get the site in Bordon if the houses can be built in Passfield! The most hilarious part of the application is that they think the 160 car parking spaces provided are going to be adequate. Cars are not a luxury in Passfield, they are an absolute necessity. Given that young adults can no longer afford to move out, you can guarantee that family housing will have young adult car drivers living at the premises. If, erring on the side of caution, you imagined that every bedroom had a driver in it you would need 253 spaces. Obviously not every house is going to have other people that drive but every adult will have a car [they will need to living in Passfield]. Many will have young families � but looking to the future � when those young children get their cars��� and bear in mind that there are only 18 visitor spaces for the entire site! That�s 111 cars that would be fighting for 18 visitor spaces. And what happens if [God forbid] any of these people actually have visitors!!! From the planning application I note that no builder has been assigned to the project? This is purely planning application and not associated with Taylor Wimpy. Its probably a bit small for their liking. As a local resident this application and its wider plans seems quite sensible. It would certainly benefit the area and local economy and there are many ways we can all work together to ensure that Passfield retains its appeal with nice housing, good transport links, safer roads and good internet connectivity. Easy to say when you live over the other side of Passfield Julian. Perhaps you are not aware what is going on in Bordon not to mention the rest of the planned (and permissioned) development for the Liphook area! There is no lack of activity. I would have a look further up the thread at Dawn's letter sent in 2016 which sets out very clearly the likely problems with this development. @ Dawn - bad case of NIMBY me thinks! "good transport links, safer roads and good internet connectivity"
Nice to see your well developed sense of irony, Julian. Nice to see everyone coming together as a community on such an important matter. Bordon seems a disaster, so let's not make Passfield one too. There are only 4 public comments on the planning application to date and it's important that everyone takes the time to present their views. We should also consider what might happen if planning were not permitted. Surely there must be some strong opinion there too? The only thing that will happen if the planning is denied is that they will try again in a few years. The owner is not going to try for permission for anything else because housing permission is the most lucrative. The planners simply MUST think about where excess cars can park. They can't just cross their fingers and hope that people won't have cars. They can't think that allowing cars to park on Hollywater road, in front of a blind corner is ever going to be safe? I'm one of the few people in Passfield that don't object to houses being built. We all have to live somewhere and Passfield is a lovely place - BUT it is a lovely ISOLATED place with ZERO available parking on any of the surrounding roads. Any cars at all on Hollywater Road - even one - will cause disaster. People come around the corner (from the Liphook direction on their way to Whitehill and Greatham A3) at fast speeds - to be faced with parked cars at that point is death waiting to happen. It's the same in the opposite direction - cars coming from Whitehill on their way to Liphook are going very fast and the position of the righthand bend blocks any view of the Lynchborough Road junction that they are approaching. Drivers have no idea that there is a likelihood of cars pulling out of Lynchborough - or even worse, that a car may be stationary waiting to turn in. If there were cars parked on Hollywater in any position close to Lynchborough Road it will end in a nasty accident. So - if they can't park on Hollywater or Lynchborough - WHERE are they going to park. That is all I want to know to satisfy myself. Don't tell me there won't be cars - just tell me where they are going to go. Obviously, there are also going to be other issues, no internet, a substandard electricity supply that has consistent powercuts throughout the year but particularly in winter, no walking routes, no bus on weekends and school holidays, no doctor, dentist or any amenities at all.........however - although these are going to be a nuisance for new (and existing) residents, they aren't life-threatening. I've seen too many people die on the junctions of Hollywater Road to ever think that the risk is worth it. With reference to parking concerns, Silent Garden is not yet complete yet the management company have recently issued a letter to all residents because of the lack of parking there and the problems it is already causing. They are even considering a parking control scheme in order to ticket any cars that are parked on the estate roads and any non-visitor cars using visitor spaces! EHDC Planning should not let developers get away with maximising the density of housing at the cost of restricting the amount of parking. Dawn,great stuff, but I don't see your objection on EHDC yet? Are you planning on adding to this,there are 2 neighbour objections and one from local council,and some criticisms / advisories from the P&CC ? As your note / question re the no13 bus, has little response, I would assume there is little use of the part time service [ so called] as its so invariable,and unhelpful for most living in the area. Your original letter of objection was very detailed, are you repeating this objection? In this area,there is no identified need for housing,leaving the bats & botany out of this [ all very SI,& a 'nice to have'], but as yet there is no 'need' clarified,from what I can see anywhere. Nothing from the developer either on paying for the upgrading of the antique Passfield exchange,all glossed over...for all those who have little / no local knowledge of the little infrastructure. Its with reading all the documents submitted with the planning application. Take the time before submitting your views on the planning portal. They address every single point that are ever likely to be questioned. There is even a tree report down to every last shrub and its intended fate. This is a well thought our application that should benefit Passfield. Its sometimes worth supporting & working with developers to get an agreeable compromise rather than objecting to everything without reasonable grounds to do so. I have seen friends over in Bordon rip their scrawny shrubs and chipped bark supplied with their new 'affordable home' and replace it with hard standing for a car. Its done tastefully of course and provides a solution to a parking problem. No one in Arundel Close was informed about the new application so I only found out when a kind neighbour knocked on my door to tell me about it. I've got to read through all of the documents yet along with working full time and all of lifes's other commitments. I submitted my objection today - I just got back from holiday in time to read through all their documents. I was disheartened to see that there were only 19 other comments from neighbours! So - I made mine very long - to cover every aspect which I found disagreeable. I MOST STRONGLY object to the parking quotas being used in this rural 'satellite' hamlet. Every person of driving age will have to own a car in this location and any planning consent must be contingent upon this. In addition, it is unacceptable to hold one development to ransom with another development elsewhere in another completely unrelated location. If employment sites are needed in Bordon then it is up to the developer 'in Bordon' to build them without forcing through unnecessary housing in a totally different location. The sites are not linked, the two locations could not be more diametrically opposed - it is a nonsense to 'link' them. The Whitehill and Bordon regeneration has been in the pipeline for many years and has always had an industrial/employment provision built in. Why should this latecomer to the game be used to hold the people of Passfield to ransom when the plan was always to build 'employment' provision on the Louisburg barracks? I will address my objections in turn and respectfully ask that you consider each issue. Although other issues are of importance, the serious issue of car parking dominates as the most damaging proposal which will irrevocably and detrimentally affect the character and visual amenity of the area - which up until now has not had to deal with on-street parking issues. According to the East Hampshire District Local Plan's draft for 'Vehicle Parking Standards,' it is clear that EHDC concurs with local feeling on the dangers and detriments of street parking. We do not have on-street parking in Passfield as the roads are too narrow to accommodate it (apart from the overcrowded Lyndons). The low number of spaces available will most definitely result in indiscriminate parking on pavements, grass verges and in neighbouring roads - which have no capacity to deal with additional cars. At the OSU Site in Liphook, less houses were built (62 homes), and a parking ratio of 2.1 spaces per dwelling at 132 spaces was foolishly agreed. This site is close to Liphook railway station so it could have been argued that people may walk or cycle to the station and perhaps would not need such reliance on motor vehicles. This application in rural Passfield gives only a miniscule upshift to a parking ratio of 2.3 spaces per dwelling. We do not want a repeat of the OSU Liphook disaster where cars are permanently parked on grass verges, driveways are too short so long cars hang over the road, cars are parked dangerously on corners, cars obstruct pavements, cars block people in (or out) their homes by parking in front of dropped curbs and driveways. When people return home from work at the end of the day, the last thing they want to do is drive around the block 3 times looking for a place to leave their car - or worse - find that they can't get into their driveway because some other poor person with no space has abandoned their car after finding nowhere else to go. This is the problem when you rely upon inherently faulty traffic and transport 'experts' who are specifically paid to come to a conclusion that suits the developer. They do not reflect reality. Realizing after the event that the development causes traffic misery is too late - you only have one chance to get this right and not ruin this side of Passfield irrevocably and forever have the shame of that legacy on your shoulders. All of the roads in Passfield are narrow and do not allow for on-street parking. The misery that ensues when overspill/visitors cars are left in the road is evident in The Lyndons - although not as bad as the OSU Liphook site the Lyndons is still too high in density to sit well with the rest of the hamlet. The Lyndons is a higher density than everywhere else, but allows for a minimum of 2 parking spaces per residence - it is not enough and overspill vehicles cannot park anywhere else without creating a hazard. Your own statistical evidence establishes that in as far back as 2011 every household had (as a ratio) 1.6 cars per dwelling. Not only have the numbers increased since 2011, but vehicle sizes have increased. EHDC has the highest proportion of households with 2 cars or vans, and households with 3 cars or vans. Passfield is most certainly going to be one of those locations given its isolated nature with an inefficient, ineffective and general lack of alternative modes of transport. 160 parking spaces for 69 dwellings is wholly inadequate. Minimum sized spaces do not accommodate works vans or work lorries that many tradespeople have in addition to their own cars. In addition to this, there is wholly inadequate parking allocation for visitors and nowhere on the surrounding roads for visitors to park other than the highly dangerous Hollywater Road. Parking provision for new sites such as this should not create undue impact on the built environment, street congestion, road safety issues or create tensions within a community. However, that is exactly what will happen if you allow this to go ahead in its current form. It is therefore imperative that such high-density housing with such low levels or parking provision be denounced as unacceptable. To do anything other than this would fly in the face of national policy. Come and walk up and down Arundel Close, or any of the other roads in Passfield [except The Lyndons which was another foolish mistake) and you will see very low-density housing with very high levels for parking provision. It is like that for a reason - it is necessary. There is only one high-density low parking provision road in Passfield - even one is bad enough - there is no need to make the same mistake twice! Young adults can no longer afford to move out, you can guarantee that family housing will have young adult car drivers living at the premises. In our family home, we comprise of myself, my husband, our three sons and in the annexe - my father. In addition to having one car each, we also have a camper van. There are 7 vehicles on our drive at night. Apart from having a 'granny-annexe' we are not unusual - that is simply the reality of living here. These are family houses that are being built, and due to the specific and individual nature of this location - everyone will need a car. It is not possible to consider living here without one. Youngsters in this location all take their tests as soon as they are 18. If they are to travel from hamlet to hamlet to see their friends, or want to get to college, or have a job to go to - they have no choice. Obviously not every house is going to be full of young adults with cars, many will have young families - but looking to the future - when those young children get their cars......... and bear in mind that there are only 18 visitor spaces for the entire site! That's 111 cars that would be fighting for 18 visitor spaces. And....what happens if [God forbid] any of these homeowners actually have visitors!!! The lack of adequate parking will cause an intolerable situation in Lynchborough Road and risk cars being parked on the approach to the horrifically dangerous Hollywater/B3004 Junction. All of the roads in the immediate vicinity are very narrow, however - it is tolerable because there is presently no 'on street parking'. - Hollywater Road is too narrow to allow for both on-street parking and a fire engine to pass, it is a dangerous Road with a proven history of traffic accidents. - Arundel Close is too narrow to allow for even one parked car. (Arundel close is not marked on the site plan). Even for regular car parking, there is not enough provision within this new estate, but what if, for example, the new homeowner also has a works lorry or works van? Too big for the designated parking area - where's it going to go? Planning Practice Guidance documents give detailed guidance on NPPF parking policies. There is a requirement on local planning authorities to "seek to ensure parking provision is appropriate to the needs of the development and not reduced below a level that could be considered reasonable" (PPG, Paragraph 008, Reference ID: 42-008-20140306). Any cars that are forced to park anywhere near the death-trap that is the Hollywater Road junction is not just 'unreasonable' it is downright dangerous and should never be allowed. The guidance states that ........... maximum parking standards can lead to poor quality development and congested streets and provide greater freedom for local planning authorities to set parking standards appropriate to their areas. (PPG, Paragraph 008 Reference ID: 42-008-20140306). In accordance with policy, it is important that EHDC's parking standards reflect local circumstances. The East Hampshire District Local Plan: Joint Core Strategy (JCS) 2011-2028 CP29 states that development will need to provide car parking in a way that secures a high-quality environment and is conveniently located, within curtilage wherever possible, taking account of relatively high levels of car ownership where necessary. At (paragraph 8.25) it is pointed out that within the district the high levels of car ownership and limited public transport, combined with the rural character of the area, mean that a reduction in parking capacity or further discouragement of parking would not necessarily discourage car use. In rural areas like Passfield, car use will not be lessened by restricting parking spaces. The developer can promote public transport as much as they like but, in a rural hamlet with no reliable alternative modes of transport and where there is higher than average car ownership, appropriate provision of parking is absolutely necessary. This is acknowledged by central Government who state that "failure to provide adequate parking can lead to parking misery, and be to the visual detriment of otherwise well planned and designed developments. It creates a harsh urban landscape. Rather than cram in as many houses as possible with totally inadequate parking provision for both residents and visitors; in an area such as Passfield, which has both higher than average car ownership given its isolated nature, and also higher than average rad traffic incidents due to the unlit, narrow and dark roads, there is compelling justification for the introducing better, more generous, parking standards. As far as visitors are concerned, can you imagine what it would look like if even half of these houses had people for Sunday lunch - absolute mayhem. Don't get me started on Christmas visitors! We also seem to have a high number of working parents in the area and a correlating high number of supermarket deliveries from Sainsbury's, Tesco's, Ocado etc. Where are those lorries going to park? The national shortage of property in the UK has created upwards pressure on house prices making them out of the reach for young people in both the rented and purchasing sectors. This has resulted in more and more young adults living at their parents' home. The Office for National Statistics state that young adults are more likely to be living with their parents than at any other time in the past 20 years. A fifth of 25-to-29-year-olds lives in the family home and HALF of all 20-to-24-year-olds. There are now 3.3million 20-34-year-olds still living with parents. It entirely predictable that family houses in Passfield will also house young adults - because that is the same in every village in every county in the whole of the UK. Passfield is not suddenly going to buck this trend! Despite EHDC's minimum parking requirement being 1-space for a 1-bed residence, the council needs to be aware that for every couple living in that residence BOTH will have a car and may also have a works van. That every two bedroom house may have a couple in the main bedroom [2 cars] and a young adult in the second bedroom [another car] etc etc. Not only will the proposed parking ratio of 2 per dwelling cause parking on pavements, blocked pavements, reduced safe sight-lines, carriageways blocked with stationary cars on narrow bendy roads, parking on the corners etc. it also does not take into account of the size of modern motor vehicles or vans. I urge you to ignore any "maximum standards" for parking, particularly those which provide garages and spaces in front of them that are not big enough to accommodate modern family SUVs (and open the doors). Family cars suitable for today's living are taller, wider and longer than the standard 2.4 x 4.8m. It is not unusual for SUVs to be 5m in length and significantly wider than the garages allow in most modern developments. If your vehicle is 2 metres wide [most SUV's] and the garage is only 3 metres wide - it allows only 50 cm for each door to open - this is not enough to get a pram out, for a pregnant person to even get in/out - let alone disabled people. This creates a big storage cupboard and one more car on the roadside, cars overhanging the end of driveways and causing an obstruction on the footpath. Just as has happened at the OSU site in Liphook. Minimum standards are only a starting point and it is imperative that EHDC do not just accept them. If housing has to be here, then these minimum standards should be made much higher to accurately reflect real vehicle ownership and usage in this hamlet. This is not a site where people can do without a car. The council's requirements in respect of affordable housing are given in Joint Core Strategy policy CP13, as 40%. It is not acceptable to cancel out any affordable housing in Passfield by providing something in a town of a completely different character 3 miles away. The type of people that wish to live in a rural hamlet with no amenities or facilities are not the type of people who would want to live in a built-up urban location such as Bordon new town. I'm sure that the new town in Bordon and Whitehill will be attractive to some people and it will have it's own affordable housing options - but that does not mean that zero affordable housing should be offered in Passfield. It is not logical at all and itis entirely unfair to local people. This hogwash written by Bellamy Roberts in 2017 is absolute nonsense. It states that as far as traffic generation is concerned - having 69 family houses - with children going to school twice a day along with all the other numerous trips required for family life....... That there will be fewer traffic movements than currently exist and there would be no additional queuing at the local junctions. How is it possible to state that the number of traffic movements (if 69 new dwelling are built) can be lower than they are at present? This is absolute fantasy! The statement that rebuilding the Business Centre in Bordon would allow more employers and employees to utilize public transport 'getting to and from work' is total rubbish given the uselessness of the number 13 bus - which is the only bus in the immediate area. They are simply not being honest or realistic and statements such as these throw the whole report into disrepute. EHDC data shows that, on average, half of the residents of East Hampshire travel to work by car - this is a high proportion but it is absolutely guaranteed to be lower than the figures for Passfield. If you go to work and live in Passfield - you are going by car. That means almost 100%. The Business Centre by its very nature is full of people that arrive at 9 and leave at 5. They make one journey in - park for the day - and one journey out. It is beyond ridiculous to suggest that homeowners with families will mirror this routine. The traffic report reaches an absurd conclusion when it states that because there are existing movements these new houses will make additional movements insignificant. The revised highway report submitted states that actually they think traffic will be less?!. Less!! What utter garbage. The report on traffic flows, from the supposed expert, is that traffic on Lynchborough and Hollywater will be lower than now, and there will be no effect on safety. This is utter drivel, particularly when taking into account the overspill parking which will have nowhere other than Hollywater Road to park - which is a well-known local traffic disaster zone. Leisure trips are also by car, as are doctors, hairdresser, dentist so car ownership here is higher than many other districts within the county. The impact of this being that most households have more than two cars, these cars need to be accommodated to prevent anti-social parking and a detrimental impact on the road network. Seriously, comparing 'static' office workers who drive in once at 9am and out once at 6pm - with the comings and goings of a family is like comparing apples and pears. I have never read such rubbish in my entire life and anyone with a brain cell can appreciate that this is verbal diarrhoea of the worst kind. There is a large body of commuters in the hamlet and these journeys are either by train - driving to Liphook Station or driven the whole way in cars or vans. It is not just the journeys to schools that need to be accounted for in the survey. It is unreasonable and fatally flawed to conduct a traffic survey which excludes this rush hour time period. The survey undertaken by the developer counted traffic movements only between the hours of 4pm - 6pm. It is also statistically fatally flawed to accept the comparator in this instance. There can be no comparison between an employee who is duty-bound to remain within the premises to conduct his work - and the prerequisite movements of a family. 69 family houses x 8 movements per house per day. That is 552 movements - given the nature of this location, its remoteness, lack of any amenity and lack of any public transport to get to school - I would say that is a VAST understatement. That IS NOT in any way a 'negligible impact' compared to what is there. Need for housing in the immediate area. Given the vast number of new homes in the two nearest villages which already have permission [Whitehill and Liphook], there is no proven need for additional housing in Passfield, which is a hamlet with no facilities. The local allowance for new housing in the Wealden Heaths SPA and Woolmer Forest SAC has already been exceeded and any residents in the Passfield area would have to travel, by car, to reach any facilities [school, GP, supermarket, dentist etc] to either Whitehill or Liphook thus increasing road traffic on the B3004 and Hollywater roads. Not only have housing limits within the settlement boundary been reached, and exceeded - this proposed plan includes land which is outside of the settlement boundary. It is true that the reassessment of the settlement boundary line is overdue and that widening the settlement boundary will increase the amount of housing that can be provided - however - given that these limits have far been exceeded in both Liphook and Whitehill there is little need to do so. Any building outside of the settlement boundary goes against all planning policies and it is argued that the whole area should be withdrawn from the settlement boundary given the current overcrowding of Liphook. Passfield is the green buffer between Liphook and Whitehill and should not be turned into a mini-Whitehill just to suit the developers' pockets. If Passfield is viewed as a whole it is an extremely low-density hamlet with very few houses within it. The new housing development in The Lyndons which is opposite the proposed site is already at a density which is much too high and despite having at least 2 parking spaces per dwelling the overspill of cars parked on the road causes access problems. The density proposed for this new site is ridiculously high - more what you would expect in a city centre/urban environment. Although the perimeter of the site is a green ancient hedgerow, there is no planting inside the site to any degree. The overall effect is brick walls in every direction. 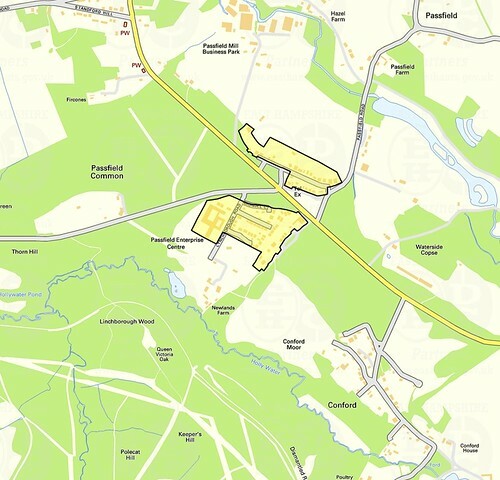 Passfield is ringed by commons and this site is adjacent to Wealden Heath which is a Special Protection Area (SPA) and Special Area of Conservation (SAC) under the EU Habitats Directive. As such, this expanse of brick walls with no planting and no green space within the design to speak of is wholly unsuitable for a green hamlet such as Passfield. When you consider that in the entire hamlet of Passfield (which covers a large area) there are approximately 100 houses - to shoehorn 70 more into such a tight space cannot in anyway be deemed to be 'in character' with the rest of the hamlet. Regardless of how many 'dwellings per hectare' this is recorded as - it is too high for such a rural hamlet - particularly given the shortage of vehicle accommodation. We do not want a repeat of The Lyndons with its road that is way too narrow, garages that you can't park a car in as well as open doors, and no off-street overspill available without blocking the road to emergency vehicles and dustbin lorries. Any development should, instead, copy the rest of the hamlet of Passfield taken as a whole - the example would be to copy the density in Arundel Close immediately opposite the site. The government's national planning policy framework, as one of its core principles, includes a requirement for new housing estates to be placed in locations which can be made more sustainable, to encourage sustainable transport such as buses, walking, and cycling. That is entirely impossible in Passfield. Howard Hutton & Associates write that the site is........within -300m walking distance to local bus stops with the nearest one being 'The Green' on the B3004, with buses heading both North-West and South-East from this location. The nearest trains station is Liphook, located -2.8 miles away from the site. There is also a bus and coach station at Bordon, situated approximately 3 miles away. As such there is some public transport provision in the local area providing the residents with alternative means of transportation........."
They also write that "............ The residents of the Proposed Development will be encouraged to use sustainable alternative modes of transport. Any affordable units will have secure external cycle storage and the private use units will have secure garages with space for cycle storage. This will give residents easy access to secure storage for bicycles and promote their use......."
What utter tosh! No parent in their right mind would allow their child to walk along the B3004 into Liphook - which (despite road signs indicating otherwise, is a 60mph narrow road with no lights or pavement, ditto for cycling home after school in the dark. Neither would you allow the 3-mile pitch-black cycle to Whitehill to get to the other bus stop (never mind that you can't take your bike on the bus having reached the bus top). It simply is not an option for this hamlet, and, unless the developer is planning to widen the road all the way to both Whitehill and Liphook to create a cycle lane and footpath this is never going to be achieved and it is dishonest for anyone to pursue the argument that it is even a remote possibility. Train: Liphook train station is not within walking distance and there is no pavement in any event. Walking and cycling: There are no safe walking routes into either Liphook or Whitehill. In winter the verges are muddy and slippery, in summer they are overgrown verges full of stinging nettles. There have been instances of pedestrians being hit by cars when walking along the road and/or crossing the roads. This is because the nature of the roads (both the B2004 into Liphook and the Hollywater Road into Whitehill) give rise to cars driving at excessive speeds, they are narrow and unlit with no pavements and are entirely unsafe to either walk or cycle along. Bus: The number 13 bus service is so limited that no one in the hamlet uses it. It runs during school term times and not at all at the weekends. The service starts at 7.15 am with a break until 9.00 am then finishes at 5.45 pm. It is not possible to get to work in Liphook for 9'oclock unless you are prepared to get in 50 minutes early or 10 minutes late. Although, in theory, the number 13 should link with the number 18 [meeting at Whitehill] there is no seamless linking of the two routes - consequently, a trip involving the two buses can take many many hours. Ditto the link with the train timetable - there is no joined up service which means a vastly extended wait time. This is the reason that people who live in Passfield learn to drive at 17 and get cars - otherwise they would be entirely stuck. This is particularly true of the youth here who must drive out to get to pubs, clubs or any other social nightlife. Bus and train to vital services non-existent: The Bramshott and Liphook Parish Plan should be taken into account when considering this application just as the Alton Neighbourhood Plan formed part of that Development Plan. It can be seen from this how difficult it is to get to our local hospital in Haslemere by public transport (almost impossible for non-ambulatory patients or others with mobility/health issues). Passfield is a uniquely isolated, secluded and remote hamlet which is 'cut-off' from all other areas by a corridor of 3 miles or so consisting of dangerous, unlit roads, no pavements, and no street lamps. The roads are treacherous for walkers or cyclists and the Hollywater junction has seen dozens of motor collisions and numerous deaths. Liphook and Bordon are the nearest places with any amenities. The hamlet of Passfield has no train station, doctor, dentist, school, bank, post office etc. - it is exceedingly rural with mainly unlit and unpaved routes for both road and pedestrian traffic. Only the main or newer roads are tarmacked with the other roads around the woodlands being unmade and unadopted. There is no footpath or cycle path into either Bordon or Liphook. What tarmac roads there are, are unlit; have no cats-eyes and no white lines in the majority of the hamlet. The main route to Bordon, Hollywater Road, is only just wide enough in places for two small cars to pass. The only pub, The Royal Oak, is about half a mile away down this road, with no safe walking route and where recently a pedestrian was knocked down and killed. It is entirely unsafe to cycle or walk along these roads to access the nearest villages with amenities. All trips must be made in a vehicle and even then, the speeds on the B3004 and the Hollywater Road, which is pitch black at night, have resulted in a large number of RTA fatalities and near death collisions. There are 'shrines' to the dead in numerous places in our hamlet. One of the major 'draws' to Passfield is that it is within the catchment area for Bohunt Academy. However this is 3 miles away and the B3004 is unsafe to walk or cycle along given the unlit, unpaved rural situation and no footpath or cycle path. Millchase School in Bordon has the same problem - there is no footpath and too many incidents and accidents involving pedestrians. Overall the lack of facilities in Passfield ultimately results in major increased traffic along the Headley Road into Liphook. This route is already gridlocked during the school-run time and rush hour. Although this development is for a proposed 69 houses - it must also be added into the many thousands of houses in Whitehill - all commuters within which will be travelling to the nearest train station - Liphook - along the Headley road. The entrance and exit to the site will have a drastic detrimental effect on the houses immediately opposite who will have to deal with headlights shining into their windows at all hours. Currently, residents in the area use the verge along the Passfield Business Centre for overspill parking despite having 2 parking spaces per residence. However, thirteen houses in this new proposal have driveways directly off Lynchborough road. This means that the overspill cars that already exist in Lynchborough road will have to move somewhere else and there is nowhere else without moving onto Hollywater road which is an accident blackspot. With no planting and no green spaces, the view of nothing but bricks two storeys high is a visual detriment to householders surrounding the site. Particularly the houses immediately fronting Lynchborough Road. Also, as the parking spaces in front of each house is side-by-side, the overall effect is that the front yards are entirely of hard standing with no lawns or trees to soften the blow. Although the developer states that the current building is an unsightly former laboratory, it is a building that is a single story and one that is absolutely dark, and quiet, after 6pm and at weekends. The impact of such a large development in such a small space will double the size of this half of the hamlet and have an irreversible detrimental effect along the same lines as the new houses on the Former OSU Site in Liphook. Garages not big enough for modern cars so used for storage with cars parked up either in the road or in front of the garage doors. It creates a very hard 'urban' looking landscape. Parking spaces need to be fully functional, and designed for usability, rather than to meet quotas, having cars piled up, with no green spaces or apparent front gardens makes the whole place look like one big car park and this dominates the street scene in a very negative way. It is disingenuous to state that just because there is asbestos in the building that it cannot be modernized and maintained as an employment site. There are thousands of buildings built during this period which have been modernized and the only reason that the site is falling into disrepair is because the owners want it to. Having an employment site in the hamlet is an entirely different proposition to having an employment site over 3 miles away in another town entirely. It is simply not logical to link the two locations up as a joint site. The two areas are too far away and too different in nature to be considered as a single con-joined application. One is a busy town-centre the other a sleepy hamlet. It stands to reason that if your landlord is failing to maintain your workplace that you will be forced to move on to somewhere that is maintained to an adequate standard. The loss of tenants in the building has been entirely manufactured to suit this application. It is not happening because they want to go it is happening because they are being made unwelcome, not because it is a bad location, only because they are bad landlords. It is untrue to state that the Business Centre is not in a suitable location when it has been occupied as such, quite happily, for the last 50 years. It is a viable site, but like very building - it requires the owners to manage and maintain it. If they allow it to fall apart they are storing up problems and expense for the future - which is entirely preventable. Policy CP4 seeks to prevent the loss of employment sites to alternative uses unless the existing use is proven to be unviable. The site is viable - there are thousands of examples across the country of buildings from the 60's being updated and remaining in use. The whole of Arundel Close was built in the early 60's with asbestos and we are all still here! The comparison between Passfield Mill and the Business Centre. It is not reasonable to compare these two diametrically opposed sites. Passfield Mill is an industrial site full of car repair workshops, and other noisy, dirty and smelly industries and the Business Centre is a quiet office based environment. They are completely different sites and these workforces and not interchangeable or comparable in any way. It should also be noted that (apart from one internally incomplete unit) Passfield Mill is fully occupied and has been so for 20 years. We know this as we investigated thoroughly as we needed a unit and could not find one in this area (we now have a unit in Nyewood which is the only other industrial estate that takes motor trade within 10 miles). As one site is totally a "blue collar" site, full of trades and the other is "white collar" full of office workers it would absolutely not be possible for Passfield Mill to accommodate the displaced office workers that wish to remain in Passfield (even if they had space - which they don't). Every school child, college student, and adult needs to use a computer. It is an imperative essential part of life these days. I work from home and often have to conduct skype conferences as I am communicating with the Deaf community using British Sign Language. It is commonplace for our speeds to be so slow that these conferences cannot take place. My youngest son could not even upload a PDF file for his university last week. On Wednesday evening (5th September) my eldest son took a reading of our internet speed, which was 0.12 megabytes per second. I have included a screenshot of our appalling internet speeds and to think that this will be further diluted by an estate double the size of this side of the hamlet is simply unacceptable. Regardless of the government trying to force providers to install fast broadband in rural hamlets like Passfield - this has never happened and is quite unlikely to unless there is a change in the law to force companies to do so. There has been a very high number of collisions, deaths and near death injuries that have occurred along the Hollywater Road, the Lynchborough Junction and the Hollywater Junction. There was yet another collision as recently as last week. Exiting Lynchborough Road can be a very hair-raising business, as cars coming from Whitehill - which were previously invisible - screech and skid all over the road to avoid hitting the back end of your vehicle. This is a regular occurrence. Arundel Close, which is not properly visible on the site-map, is right opposite the apartments at the top of the road and this further reduces any available on-street parking on Lynchborough Road. Any cars parked on the road here entirely block the entrance and exit to Arundel Close. The Lynchborough Road junction is a very dangerous one indeed. The increased traffic movements from 69 houses cannot make this any better yet there seems no plan put forward by the developer for speed reduction mechanisms or to increase the sight line around the bend? More worryingly, the likelihood that cars will be forced to park along Hollywater Road is exceptionally high. With the Junctions (Lynchborough x Hollywater - and - Hollywater x B3004) already being of such a dangerous nature, the thought of cars being 'parked-up' thus reducing visibility, even more, is an appalling one which will undoubtedly have disastrous consequences. If this estate must go ahead, I urge you to enforce a sensible RURAL average of car parking spaces per dwelling which would realistically mirror real life in this area. Do not simply acquiesce to these inadequate and inappropriate minimum 'city' levels where the bicycle lane, the tube, the bus, the train and the footpath are viable options. If, erring on the side of caution, you imagined as a maximum that every home had parents in the master bedroom driving one car each and that every other bedroom had a driver in it you would need 253 spaces. That is approx 100 more spaces that currently provided for. If this estate must go ahead, highway safety measures to improve the safety at both Lynchborough Road and Hollywater Road junctions should be established at the developer's expense. If this estate must go ahead, high-speed broadband should be laid for the development and the surrounds at the developer's expense. I think houses here will be a good thing. Dawn, your objections are ridiculous! Dawn - only 19 comments from other residents shows you how many houses are here already . Very few ! The developer wants to increase the quota to over double. Not without a fight he won't! I thought Dawn's arguments were well reasoned. Only time will tell how effective the arguments are. Living on the OSU site, I agree with the parking farce, and the developer putting restrictive covenants in place so trade vehicles wouldn't "lower the tone", and simultaneously masking how bad the parking issues actually are. "Dear Taylor Wimpey...the design of parking arrangemnts could be done better by a 5 year old..." Please discuss! The new builds in Bordon also suffer from this philosphy! I have no objection to houses per se, but the main issue is the lack of consideration for what Passfield actually is, how it works, how people here live. The car is KING and unless plans adequately reflect this - they will make everyone's life a misery - not just existing residents but those wanting to move in as well. Which statement, in particular, did you think was worth ridicule? Dawn, wow really impressed. I haven't read a word beyond the first paragraph, I'll be doing that after work tonight over a pot of tea, (it was going to be War and Peace), since your comments are usually quite insightful, plus I'm interested to see if so many words were really needed! (I have a theory that officials only ever skim read the first few paragraphs and that succinct bullet points work best) but I may make an exception to my theory for you tonight, I'll let you know! Dawn, your arguments are extremely well articulated and evidenced. With regards to parking spaces, just follow the money. The simple fact is that car parking space without the associated access requires 11.5m sq of space (4.8x2.4 according to guidelines). So for a 2 story house the developer foregoes 23m sq or 247 sq ft of room space. House building is about returning a profit to the developer's share holders nothing else. The average sale price of residential property per sq ft in the South East of the UK is around �3,500 / sq m.
So, lets say �80k per parking spot is the opportunity cost vs the same area of 2 story house. Follow the money and the arguments and "evidence" fall to fewer parking places, irrespective of the real cost / impact that is passed onto the current and future residents. The "regulators" of industries are in the grip of those they attempt to control, it is referred to "regulatory capture" and has happened wherever there are regulators who attempt to account for public good economics associated with industries (often previously in public ownership) such as utilities, transport, housing etc. The "experts" go from working (in this case) for planning authorities (the regulator) to the developers (industry) via a revolving door. The evidence and effort is weighted towards the industry as they have the knowledge and resources available as the rewards are high. Couple this to the way quotas are allocated to local authorities for new housing and the overall effect is the wrong houses with the wrong infrastructure simply as it maximizes profits to industry while retiring the local authority quota for housing regardless of the real impact resulting from cars and car journeys that cannot be accommodated on the infrastructure provided. @Ian - yes It is too long. When I start writing I normally put all my thoughts on the page first, then go through it and cull/condense. However - I ran out of time for the cull/condense phase as the deadline for submitting was yesterday. So - better something than nothing even if points are repeated. I just hope that they read it and don't just 'skim'. I suspect [agreement with @Oldie] they will only skim but at least I feel I have contributed to the process. If only the other residents in Passfield had. . . . . . . . I don't care if you are for, against, or abstaining - this will make a massive difference to the hamlet - so at least have an opinion! 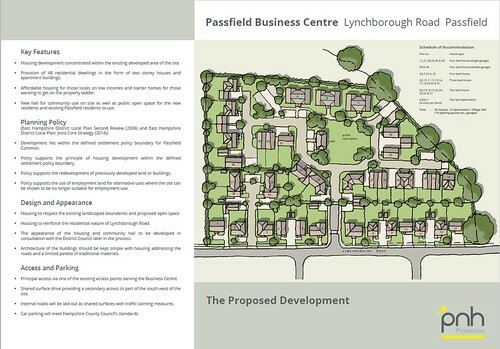 Good people of Passfield, that includes The Lyndons @Dawn, you have until the 9th October 2018 to put your objections/comments to EHDC Planning on the proposed housing at Passfield Business Centre, Lynchborough Road. My letter said the 3rd? Well that's good - I hope more people get motivated. Letters of objection can be submitted beyond the consultation period. The planning dept like to receive documents that are to the point, not long winded objections. The proposal looks perfectly acceptable and is likely to be approved one way or another, as the applicants would of gone through a pre application consultation with EHDC. Let's say an application goes in to double the amount of existing housing in Liphook- still perfectly acceptable?. Well I think that's already happened over the last 20 years? I'm afraid we need housing and this is an excellent site. A mile or so from decent schools and transport links, what's not to like. Many local Passfield residents aren�t completely objecting to the development of the site - but if you live here. You know that it is too large a development for the site and surrounding roads. It will also change Passfield from a hamlet separating Liphook from Whitehill/Bordon into a part of the urban sprawl happening everywhere. Do we have to give our the character of every small village/hamlet around? There have been smaller, better thought out developments over the years in a Passfield and people have not objected because they work practically and are sympathetic. This one is not. Not all in one go as one planning application. And passfield is 3 miles from Liphook with no transport links , footpath or cycle path . @ Rachel: It's so easy to make sweeping statements without backing them up. I'm still waiting for you to let me know which bit of my objection is ridiculous and why. 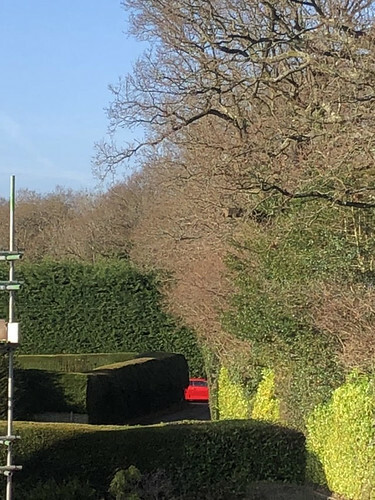 @Grant: Noone is objecting to the principle of housing as far as I'm aware, what is objectionable is the prospect of motor vehicles being forced to park of roads which have written off more cars in the last 20 years than the whole of Liphook. These 3 junctions have incidents and accidents on them on a monthly basis - and that is with no cars parked on them and clear sightlines. Any cars parked on the B3004 or Hollywater Road would be an absolute deathtrap. (well they are already a deathtrap - so 'more' of a deathtrap). Like you, I'm sure that houses will be built on the site, especially now it is a major player like Taylor Wimpey doing the legwork and greasing the palms, BUT, it is not them that flies out of their front doors to give first aid when cars crash and people die is it - it is us. did they get this approved ? I can't even find it on the EHDC web ? It is still there on the planning portal, but - it seems - languishing there with no decision yet made despite the application being submitted 4 months ago? Hi, apparently they had a 3 month extension for the decision. However EHDC Planning do not seem to update their system or people who have shown an interest/made comment!!!! The speed of traffic along the B3004 needs to be reduced to handle the extra traffic movements onto and from the road. People ignore the 40mph restriction and very often vehicle speed is upward of 60mph. If EHDC want to impose housing in any place they feel that they can get away with it then they need to work with Highways to make the approaches safe. Well, just one car parked inappropriately on Lynborourough Road has caused havoc today. This red SEAT Reg: GA57 TES has parked right opposite the junction of Arundel close this morning. All the deliveries to the building site [no:3 currently having an extension] have had to be cancelled, grocery delivery lorry also had to cancel. Lynchborough road is so narrow that you cannot enter or exit your road or driveway if someone has parked on the road. It will be such an absolute disaster if this development goes ahead with so few parking spaces per property. It would most definitely result in Lynchborough Raod and Hollywater Road being parked on. It wouldn't be so bad if road users knew not to park next to or opposite a junction of course - but some people think that the highway code is something for 'other' people! The photo above is the view down Arundel Close. What you can see is the end of the road where it joins Lynchborough Road, and the red SEAT who has chosen to park right opposite. We have this EVERYDAY when vans and mini buses park opposite our driveway. Makes it difficult to enter & exit especially when people then park either side of the driveway effectively boxing us in . The laugh is not one vehicle on their drive! Have resorted to parking on the road myself wherever possible so I can get out ! If the 70 houses get permission - I'm sure it will be a daily occurrence. From 17 February Passfield's public transport links will be getting a whole lot worse. As you were - I've just noticed that it says "additional journeys run between Liphook and Basingstoke" so perhaps the timetable is as before? Graham, as the service runs contrary to the needs of most working people - it is laughable that the availability of public transport is even mentioned at all in the planning application. It amazes me that still no decision has been made on this - local people deserve to know what is going on and to be put our of their misery waiting for this to be put to bed. Have just had a look at EHDC and they have managed to update their website with an agreed expiry date of 30 April 2019 on this application. Hopefully we will know around that time what the decision is!!!!! It really is very poor, when locals want to have some clarity, that the time windows they give are ignored like this. I see a new alternative layout has been submitted on this development! Will anyone be consulted or will it be kept quiet again? Oh really? - I didn't know this. thanks for the update - they certainly like to keep things a secret don't they! You have to remember we're dealing with Taylor Wimpey now not an independent developer - so they will know all the tricks of the rade. Really Dawn, I didn't think it was Taylor Wimpy. I thought it was an independent developer?? Interesting to read the comments from local people - although sadly - only 30 people bothered. the new layout looks the same to me? When people return home from work at the end of the day, the last thing they want to do is drive around the block 3 times looking for a place to leave their car - or worse - find that they can't get into their driveway because some other poor person with no space has abandoned their car after finding nowhere else to go. This is the problem when you rely upon inherently faulty traffic and transport 'experts' who are specifically paid to come to a conclusion that suits the developer. They do not reflect reality. Realising after the event that the development causes traffic misery is too late - you only have one chance to get this right and not ruin this side of Passfield irrevocably and forever have the shame of that legacy on your shoulders. Come and walk up and down Arundel Close, or any of the other roads in Passfield (except The Lyndons which was another foolish mistake) and you will see very low-density housing with very high levels for parking provision. It is like that for a reason - it is necessary. There is only one high-density low parking provision road in Passfield - even one is bad enough - there is no need to make the same mistake twice! Are you saying the development will produce more traffic movement than the current commercial use? Re contributions to road improvements, it's a HCC responsibility, not the developers or EHDC. Your letters of objection are rather long, not being mean, BUT, you should keep them short and to the point. The development seems well thought out, however some level of traffic calming would be useful at the junction. Seven acres of prime commercial land for sale. A perfect size for a much needed waste and recycling plant with good access to the A3. I guess my point is that if it's not housing, it is going to be something else. Rather then object, object, object, maybe we should take a positive outlook and support residential developments? I think you're a bit late to the party on this one and all the local residents involved have explained their very reasonable arguments against the large scale development of this site. If you read all the letters rejecting it, you will also note the large number of rejections from major bodies such as the National Trust - this is not simply a case of NIMBY, there are very good reasons for opposing this particular development, which have been gone over many times in the last few years and I won't go over them again. As I said, it is not NIMBYism, developments elsewhere in Passfield have not been opposed and many of us would not object to a much smaller development, but that would not suit the developer. It is still in use as industrial land as well, so it is not a case of vacant land needing to be used.